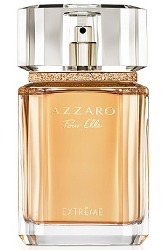 Azzaro has launched Azzaro Pour Elle Extrême, the followup to last year's Azzaro Pour Elle. Pour Elle Extrême was developed by perfumers Nathalie Lorson and Fabrice Pellegrin, who also did the original Pour Elle scent. Notes include cardamom, saffron, rose, lily, peach, cashmeran, incense and oud. Azzaro Pour Elle Extrême is available in 75 ml Eau de Parfum.